I was pleasantly surprised during an online presentation about Salesforce.com's Service Cloud 3. At first glance, it looks like a simple and powerful customer relationship management (CRM) tool that takes advantage of social networking to help connect with customers. The concept is simple. Customer input by phone, e-mail, Twitter, Facebook, and video sites displays in a single interface. This also offers information about different customers, such as their "tweeting" history, with links to relevant white papers or troubleshooting FAQs that can solve problems individual customers might have. This is all available through a Web browser, which means you can access the service, whether at your home office or on a PC at a café in the Bahamas, without downloading software. A main novelty is Service Cloud 3's aggregation. Small business users can be bombarded with tweets, e-mails, phone calls, and Facebook postings, pulled in different directions while sifting through social media sites and inboxes to address customer issues. All of these sources combined in a single screen reduces the amount of time otherwise spent clicking through various interfaces. Salesforce.com says large enterprises can use the service to combine millions of queries about a common subject. But, for a smaller business, while a dozen customer queries about a similar problem don't seem like a lot in comparison, aggregating all of the queries from separate social networks in order to craft a single response can save a lot of time. The service also supports video, although how well it works in practice remains to be seen. During the demonstration in New York on Thursday, someone posing as a customer placed a video call with the iPad 2 about a simulated product problem. Her issue was resolved by way of video chat through the Service Cloud 3 interface. While the iPad 2 capability seems nice to have, Salesforce.com says Service Cloud 3 can handle most other video calling services, such as from Skype. How willing small businesses will be to place video calls will depend, of course, but being able to walk a customer through a problem through video chat, with ready-to-access information in a knowledgebase on the same screen, sounds useful for live troubleshooting help. Service Cloud 3 follows Salesforce.com's launch of Chatter, which offers social networking for businesses. While that's a more closed, intranet-like service compared to what Facebook offers, the service allows users to share comments, gather and list information about different subjects, and share content with colleagues. 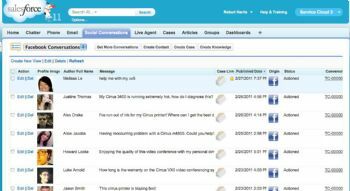 Users can share input from Chatter with Service Cloud 3 to address customer issues. Service Cloud 3 extends what Salesforce.com previously offered with Service Cloud 2, with the addition of the new social networking capabilities. Not all of the functions displayed Thursday are available yet. While you can purchase Service Cloud 3 today, the Salesforce for Facebook features will be available by the end of April and will be free for Professional, Enterprise and Unlimited edition Salesforce.com customers. Salesforce.com has built a business model based on offering cloud computing services on a pay-as-you-go basis, often allowing small businesses to use powerful CRM and other tools they couldn't otherwise afford. Service Cloud 3 can potentially be useful and unique, although how well it works in practice remains to be seen. Bruce covers tech trends in the United States and Europe.